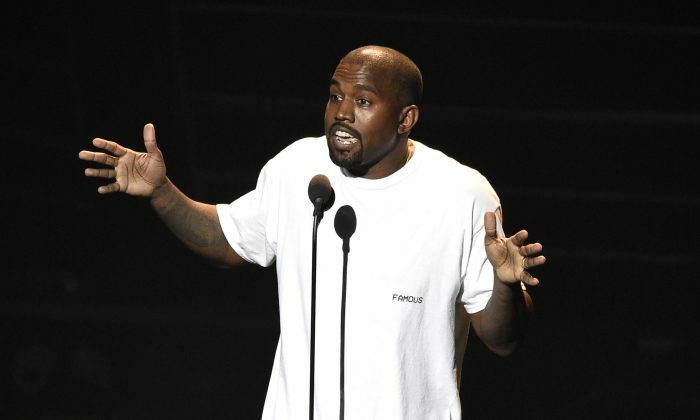 Weeks after Kanye West was hospitalized after reportedly suffering a nervous breakdown, he appeared in public at the MOCA Pacific Design Center in West Hollywood. He hasn’t been seen in public since he canceled his Saint Pablo Tour and was hospitalized on Nov. 21. The Instagram account Kanye-_Daily shared a photo of the 39-year-old rapper, sharing a photo from Giovanni Leonardo Bassan. He was at the “Rick Owens: Furniture” exhibition at MOCA. West could be seen with bleached blond hair—a feature he didn’t have right before he was hospitalized. He was hospitalized at the UCLA Medical Center for treatment, spending Thanksgiving Day at the facility. A source close to the rapper told People magazine that he was trying to make music while there. “I think Kanye’s going to come out of this stronger than ever, fully intact, creative and is going to contribute so much more awesome [expletive],” the source said. Meanwhile, while he was hospitalized, there were rumors that he and wife Kim Kardashian would divorce—but their representatives categorically denied the story. Jonathan Cheban, a friend, said that they’re not splitting up. “It’s kinda funny to me, I just literally got off the phone with them,” he was quoted by the Daily Beast as saying.